Today has been a little bit of a lazy day. We went to Church, came home and cleaned up the house a little, Bill had to run a call and I made this Strawberry Shortcake. While typing this blog entry I am also cheering on the Broncos!!! Strawberry Shortcake is a family favorite around here. 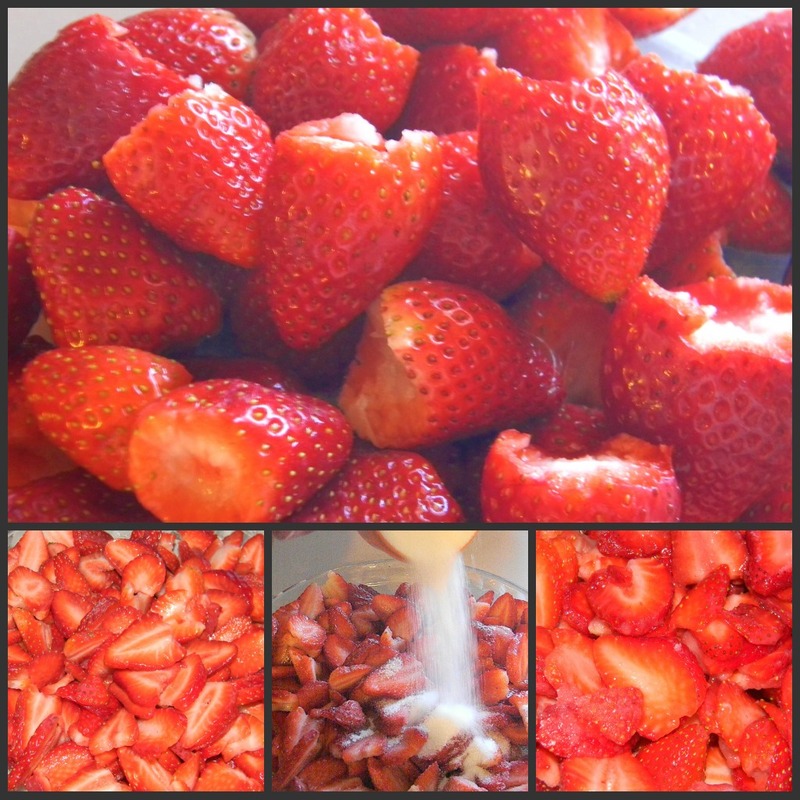 We have a strawberry patch so in the summer we make this quite often. I use an egg slicer to slice my strawberries, it is super fast and way better than having to slice them with a knife. After slicing them up I put sugar on top and then let them sit in the fridge to make some yummy juice. This recipe reminds me of the Bisquick coffee cake recipe that I remember being on the back of the box when I was little. 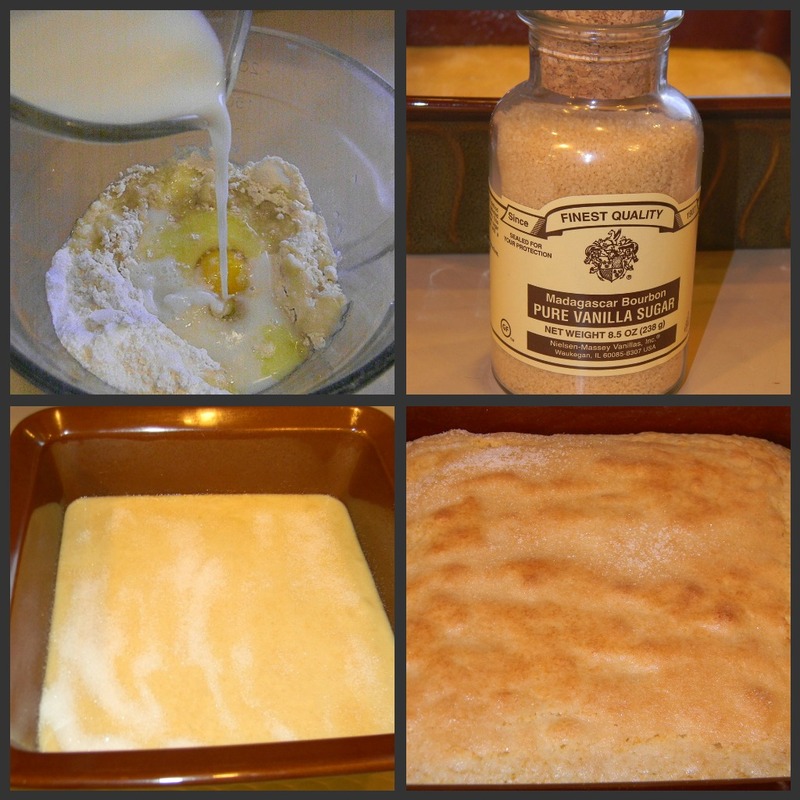 The cake is soft and by putting sugar on top it has a crunchy sugar topping on top. I also used another Christmas present from Billy on top of this cake. I sprinkled some Vanilla sugar on top before baking. Oh it smells so good coming out of the oven! Bill and the kids eat their strawberry shortcake different than I did as a kid. They put it in a bowl and pour milk over it. I am not a big strawberry shortcake fan but I do like to take just the cake and break it up in a bowl and pour milk over it...yum! Heat oven to 375 degrees. In mixing bowl, blend all ingredients thoroughly with a fork. Beat vigorously for 30 seconds. Pour into a greased 9 x 9 baking dish. Sprinkle the top with sugar if desired. Bake for 25 minutes or until wooden pick inserted into the center comes out clean. 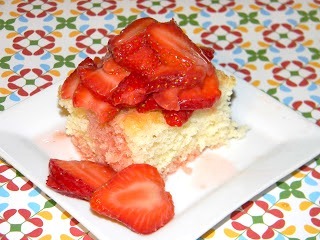 To serve: cut cake and place strawberries over top and if you wish to eat it the Jones family way put cake in bowl, place strawberries over top and cover it with milk...enjoy!